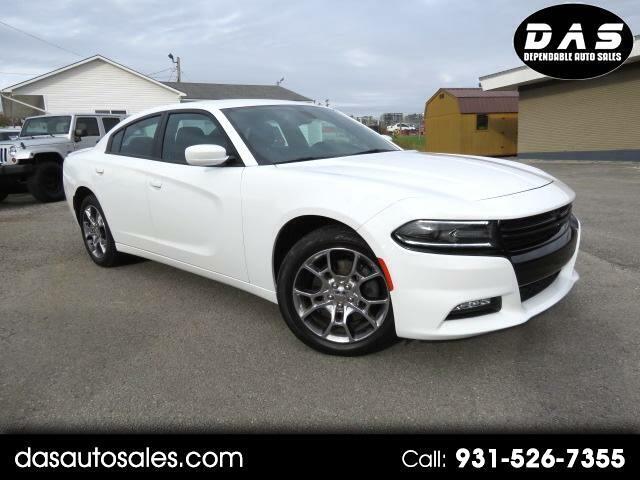 Make a powerful impression in our 2015 Dodge Charger SXT AWD presented in eye-catching Bright White Clearcoat. Lurking under the hood of our robust sedan is a 292hp 3.6 Liter Pentastar V6 that is perfectly paired with a TorqueFlite 8 Speed Automatic transmission which offers quick acceleration, seamless shifts, and still delivers near 27mpg! You can drive 570 miles before stopping for gas while enjoying the brilliant driving dynamics and the tenacious traction of All Wheel Drive! Exude confidence and bold style in your SXT with the iconic design, scalloped bodysides and imposing crosshair grille that have been redesigned for a sleek, chiseled look. Bi-function halogen projector headlamps, LED daytime running lamps and 18 inch wheels further complement the exterior. You'll appreciate remote start, HomeLink, heated power-adjustable seats, an instrument cluster with a reconfigurable display, integrated voice command with Bluetooth, satellite radio and a Uconnect touchscreen display with navigation and a backup camera. Thrill seekers can get behind the wheel and still have the safety and security that is a number one driving principle behind every Dodge Charger like Ready Alert Braking, advanced airbags, Electronic Stability control and more! Reward yourself with this powerful sedan that has perfectly blended unique old-school styling with modern innovation! Print this page and call us Now... We Know You Will Enjoy Your Test Drive Towards Ownership!